BURGLARIES: Buildings – 1/11 S. New York Rd., 1/11 Pineview Dr.
Vehicles – 1/7 Simsberry Ct., 1/12 Chanese Ln. On 01/07/2013 Kyshann Gant, 26, of Galloway was arrested by Ofc. Przemyslaw Ryba for Possession of CDS (marijuana under 50 grams). He was released on a summons. On 01/07/2013 Keith Henry, 29, of Pleasantville was arrested by K-9 Ofc. Scott Winneberger for Hindering Apprehension. He was released on a summons. On 01/08/2013 David Ruiz, 22, of Pleasantville was arrested by Ofc. Ron Gorneau for Possession of CDS (marijuana under 50 grams) and released on a summons. On 01/09/2013 Donna Dickerson, 50, of Galloway was arrested by Ofc. Patrick Neal for creating False Public Alarm and Obstruction. She was released on a summons. On 01/09/2013 Ashlyne Webb, 23, of Williamstown was arrest by Ofc. Patrick Neal for Driving While Intoxicated and Assault by Auto following a motor vehicle accident. She was released on a summons. 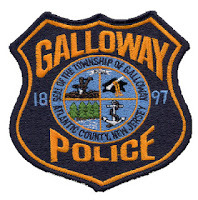 On 01/10/2013 Gwen Vartanian, 52, of Egg Harbor Township was arrested by K-9 Cpl. Mark D’Esposito for Driving While Intoxicated. She was released on a summons. On 01/11/2013 Joseph Donahue, 30, of Galloway was arrested by Ofc. Ron Gorneau for Possession of CDS. On 01/11/2013 Jordan Adams, 28, of Galloway was arrested by K-9 Ofc. Scott Winneberger for creating False Public Alarm. On 01/12/2013 Cynthia Strohm, 29, of Galloway was arrested by K-9 Ofc. Scott Winneberger for Hindering Apprehension. On 01/12/2013 Mark Coulter, 21, of Gibbstown was arrested by Ofc. Robert Bauer for Driving While Intoxicated following a motor vehicle accident. He was released on a summons.